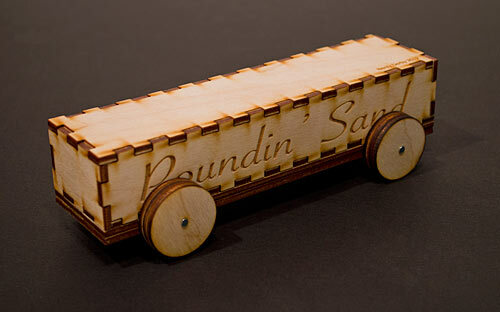 In my last post about my Nerdy Derby car, all you saw was a bunch of laser cut wood pieces… well, here’s the final car. 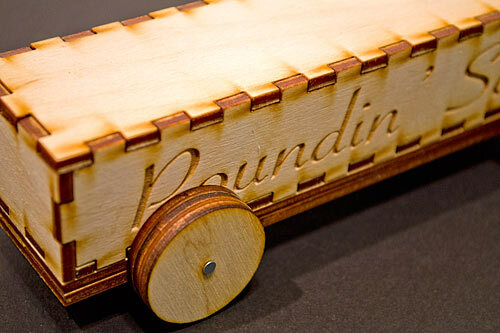 It’s almost dimensionally the same as a standard Pinewood Derby car. 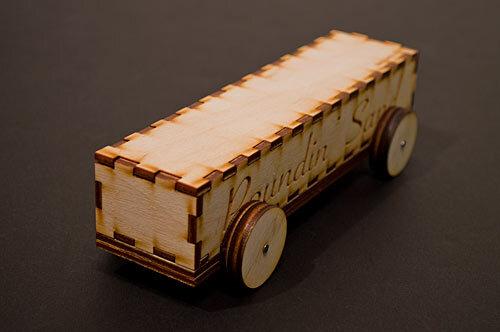 The body is constructed out of panels that were laser cut rather than a block of wood. Because it’s hollow inside, I filled it with sand. Why not lead? 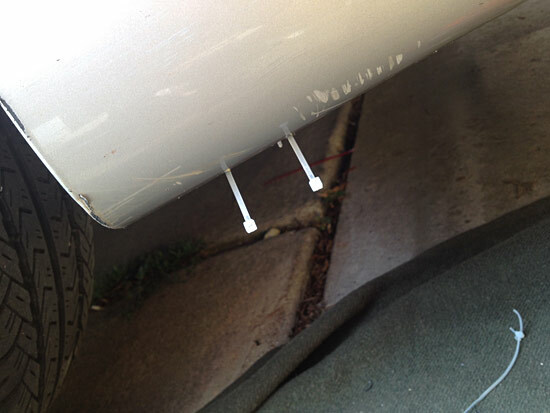 Well, someone else is already doing a car out of lead. I also though about marbles or something else that would roll around inside. I also thought about making one with acrylic and filling it with water. 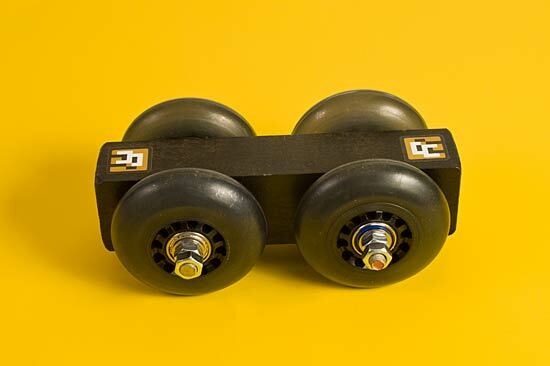 I spaced the wheels the same for the front and back, so there really is no front or back… it’s the same either way. You’ll also notice I did a terrible job of placing the lettering. I just added it to the side panels without thinking about how the wheels would get in the way. Update: Files are now on Thingiverse. 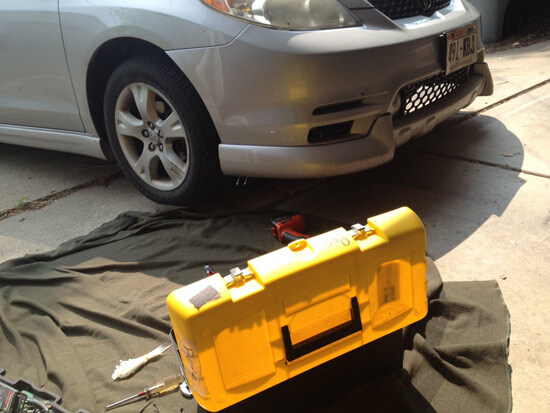 If you saw my last post about the Nerdy Derby we are planning, you probably figured at some point you’d see a car. Well, here’s my progress so far. 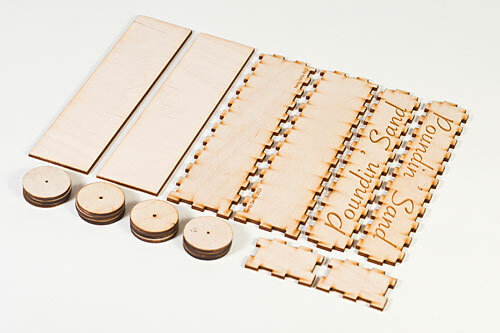 I cut the pieces from 3mm Baltic Birch plywood using the 60 watt laser cutter at Milwaukee Makerspace. 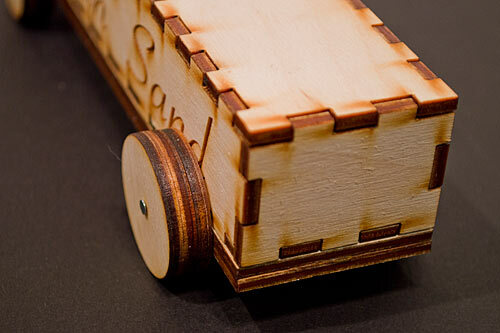 Even the wheels are laser cut. I have no idea how well it will work, but I’m all for experimentation. 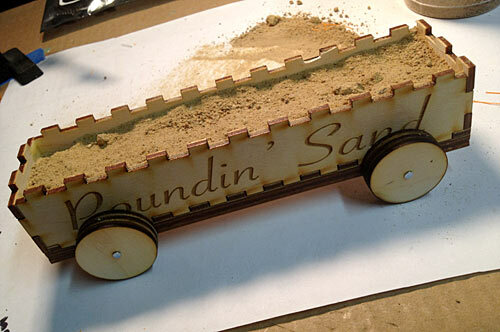 I’ve heard at least one person claim they will be building a car body completely out of lead, but I figured I already have plenty of sand around my house, so I plan to fill my car with sand, hence the name “Poundin’ Sand” (some of the runners-up included “Carl Sandburg”, “Sandoval”, “Sandy Bottom”, and “Adam Sandler”, but since “pound sand” sometimes means to engage in a futile activity, I thought it was fitting. Besides, I’ve already awarded all the style points to Frankie for his belly tanker even though he’s not done yet, come on, just look at it! 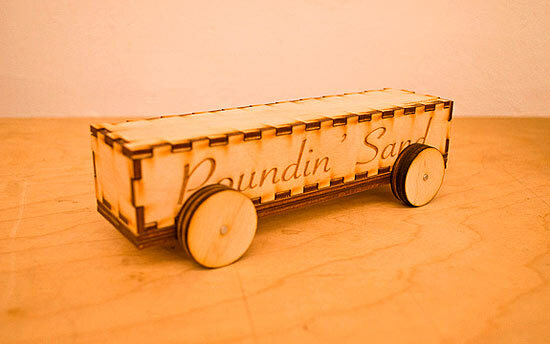 Besides the glue to hold it together, the nails to hold the wheels on, and the sand, the rest of my car is 100% laser cut wood. 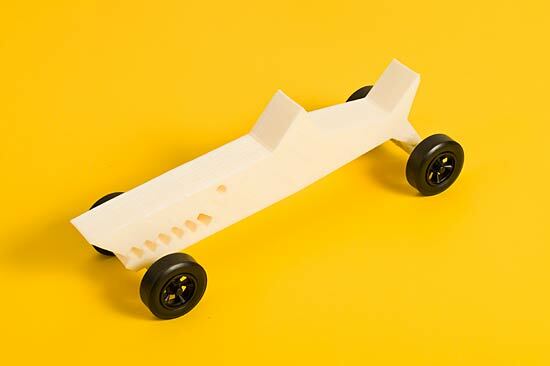 I’m also planning another car that is (nearly) 100% 3D printed plastic. 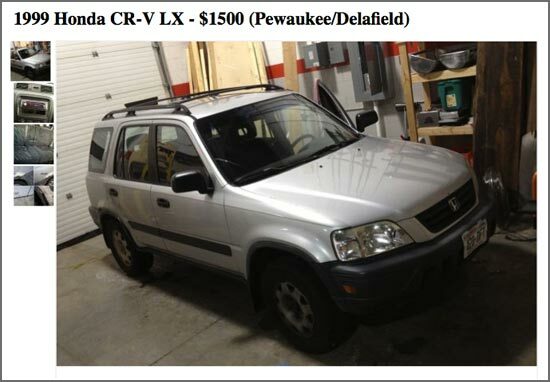 I’ve got some work to do on that yet, though the wheels should be done this week.